The deadline for AWR Studio Furniture 2018 has now passed and entries are closed! The work of 104 entrants is now shown here. The shortlisting process has taken place and we now move into the second phase whereby the body of work which will form a landmark exhibition will now be created in preparation for delivery to Bungendore Wood Works Gallery. The exhibition will open on October 20, 2018 during which winners of awards valued at $20,000+ will then be announced. The exhibition will run until January 31, 2019. We will continue to introduce the entrants in a series that will take us up to the opening. You can also see related posts in the lead-up on our Instagram page. We are grateful to our sponsors for their support: Bungendore Wood Works Gallery, Felder Group Australia and Branch 95 Timbers. 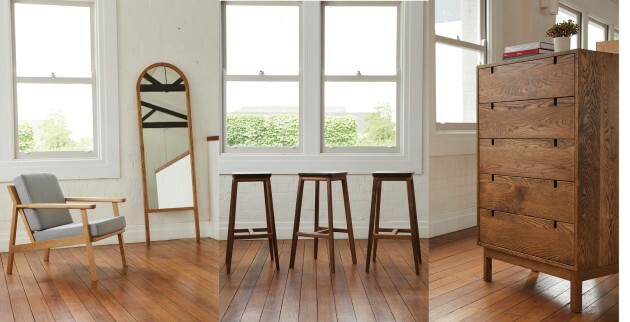 Matt Pearson is an Adelaide based designer/maker, producing furniture under his brand MJP Studio. He strives to create objects to be woven into the fabric of the family home: objects that become a living, breathing part of the family. Matt wants his pieces to create long-lasting memories for the people that use them. Matt consistently pushes and tests his abilities across many different mediums including timber, fabric, concrete, resin and metal. His designs celebrate a rich material use, attention to detail, and every piece is designed and crafted with the utmost care and sensibility. 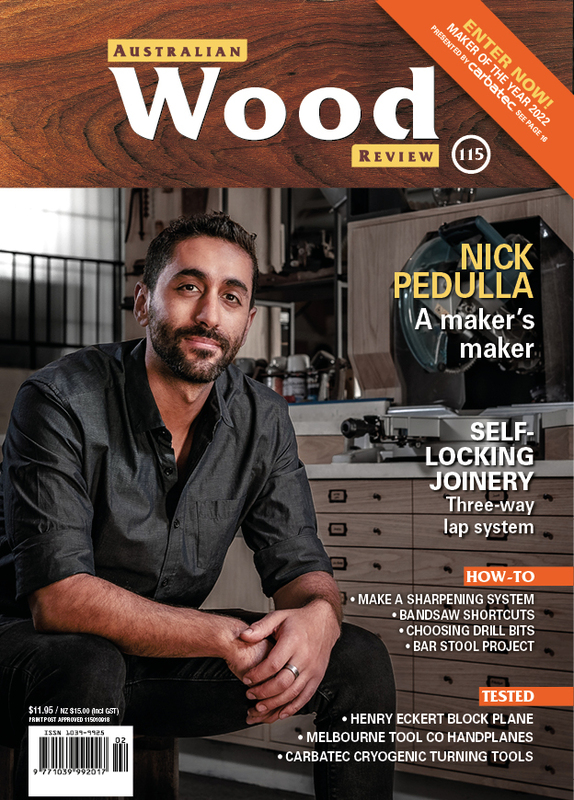 Stuart Faulkner is the owner of Sydney based woodwork school Heartwood Creative Woodworking. Leaving a successful design partnership to pursue a career as a furniture maker, Stuart graduated from the Sturt School for Wood in 1997. Commissions and exhibition works were supported and then replaced by fulltime teaching as Stuart became Head of Design at Lidcombe TAFE and later, Director of the Sturt School for Wood. Stuart Faulkner has long been interested in the marriage of technology and traditional woodworking and was awarded The Edge “Green Design Award” in 2010 for his Felix Stool at the Sydney International Furniture Fair. This theme remains part of his design thinking and is illustrated by Stuart’s woodwork bench Mybench. The first to admit that his own practice has taken a back seat in recent times, he cites the 2016 student exhibition ‘Heartwood’ as a career highlight showcasing the passion and commitment of his students and teachers. Hugh McCarthy is a furniture maker and joiner with a workshop in Melbourne. He creates his own pieces, custom makes to order and is available to collaborate with architects, interior designers and builders who need old and new woodworking techniques to enhance their projects. Hugh's furniture collection is inspired by his time working in Australia and Japan and made because needed them for his own home. He believes furniture should be useful, sturdy and serve you for a long time. Christopher Blank like to keep it pretty simple. They’re a Melbourne-made, custom-design studio dedicated to creating furniture and homewares from sustainably sourced timber. Honouring the integrity of the materials they use is key to CB’s philosophy; design and proportion first, and function built to last. Furniture maker Luke (Christopher) Atkins and designer Veronica (……….) Paiva are obsessed with timber; the way it looks, the way it feels and how it ultimately makes your house a home. Christopher Blank was born from a collective passion to produce quality, handmade pieces as a team; furniture made with their minds and hands that would play a useful part in the chaos of everyday life. Luke’s background is in carpentry – his meticulous attention to detail was honed while specialising in restoration and heritage homes. Veronica has worked in design and visual merchandising with global luxury brands for over sixteen years. Christopher Blank believe design need not compromise function; whether it’s a dining table that serves up impassioned discussions, or an armchair that you can pull up to beat your grandma at bridge, CB want you to have both. For my entire life I have made things but there is just something about the warmth, colour and texture of timber that draws me in. I’m a sucker for buying beautiful timbers whenever I can and I am constantly having to remind myself to stay focused on the particular project I happen to be working on at the time. You wouldn’t believe how easy it is to become distracted by a beautiful piece of timber. What can I make with that? How would this design look with this timber but even better that one. If I have to have just one rule it would be ‘form follows function’. The piece must do what it is designed to do. Oh, and be beautiful whilst doing it. I mostly specialise in making wooden boxes. Boxmaking forces me to become a better craftsman. The tolerances and attention to detail have to be spot on or the finished piece suffers. Besides my early ‘training’ in woodworking at school I was mostly self taught until relatively recently. Several years ago I enrolled in a course at Sturt School For Wood in Mittagong, NSW. I have had the great fortune to have been taught by some of Australia’s premier craftsman. Talented designer makers such as Tom Harrington, Leon Sadubin and Neil Scobie are some of the many who have provided me with instruction, advice and were very generous with their time and expertise. For the past 10 years I have been working as an IT professional whilst refining my fine woodworking skills. Woodworking and IT are complementary skill sets in many ways. Both disciplines demand a high level of focus, precision and problem solving. And both are fun, challenging and above all highly rewarding.